Jeannette Rankin, born on the Montana frontier in 1880, lived long enough to speak her mind on national television in the 1970s. As the oldest of seven children, she learned to take charge early. She spoke up in the 1910s to persuade men to give women the vote. In 1916 she ran for U.S. Congress and won -- the first Congresswoman in history. All her life she worked for peace and social justice. She lost her seat in Congress twice for voting against war -- first in 1917, then in 1941. In 1968, age 87, she marched at the head of the Jeannette Rankin Peace Parade with five thousand women to protest the Vietnam War. Jeannette Rankin: Political Pioneer tells the story of her long remarkable life, with photos, newspaper clippings, cartoons, and even hate mail to illustrate the dramatic role she played in twentieth-century American history. 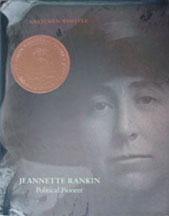 "By any measure, Jeannette Rankin was a woman ahead of her time. She was Montana’s representative in Congress before women in other states even had the right to vote. Woelfle does a terrific job introducing Rankin, beginning an attention-grabbing story in which an elderly Rankin, a life-long pacifist, leads an anti-war protest during the 1960s. Woelfle then moves back in time, restarting the story with an anecdote about young Jeanette sewing up an injured horse on her father’s ranch. Readers’ interest level will stay high throughout as Rankin finds satisfaction in working as a social worker and then discovers her calling as a crusader for women's rights. 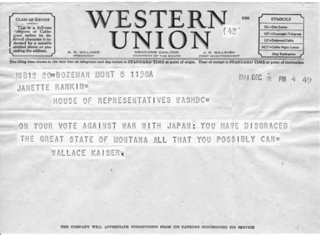 Even during her two short tenures in Congress, Rankin never abandoned her core beliefs; she voted against both World War I and II declarations of war (in the case of the latter, standing alone.) The high standard of writing is matched by the book’s format. Informative sidebars are well integrated, and from the intense portrait on the cover to the well-chosen photos and historical material, the volume offers interesting things to look at on every page. A time line, a bibliography, and source notes bolster this robust introduction to fascinating figure." Jeannette sent this card to Montana voters in 1916. 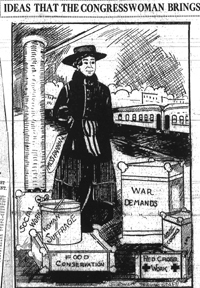 This 1917 political cartoon shows the "baggage" Jeannette took to Congress. Most people disagreed with Jeannette's vote against entering World War II, but she never regretted her decision. "....This volume is rich in photographs, sidebars, and pulled quotes--it's hard to resist a caption that notes how women's dresses got shorter and their hats got smaller...A welcome addition to the short list of titles for young readers about this important figure." "Progressive thinker and first-ever female U.S. Congressional Representative, Jeannette Rankin, was born in 1880 on the Montana frontier, and lived 93 years, long enough to speak on national TV in the 1970s. An activist, she campaigned for women's suffrage, worked for social justice for workers, women and children, and voted for peace, when others voted for war. "Award-winning author Gretchen Woelfle's impeccable research augments her energetic writing with a sumptuous array of photographs, historical documents, newspaper clippings, and even campaign materials. Numerous intriguing sidebars add depth to this remarkable story of a feminist, whose extensive travels internationally, as well as across the nation, helped keep alive her grassroots organizing for peace, and her personal sense of independence and curiosity. "Beginning with the cover portrait of a young Rankin's penetrating visage, Woelfle's outstanding, well-written biography introduces a vigorous individual, clearly a woman ahead of her time. "She praised what was best in her society and worked to make it better." End material includes a helpful timeline, selected bibliography, extensive source notes and picture source notes, plus a short, but wide-ranging index." Jeannette describes her peace agenda for the Vietnam War with Montana Senator Mike Mansfield in January 1968. 1. Women in politics – When did the voters in your state first elect a woman to the state legislature, to Congress? Search state historical society websites and others: www.womenincongress.house.gov; www.senate.gov/reference/reference_ index_subjects/Women_in_Congress. 2. Read Jeannette Rankin’s FBI file on the internet: Search for “Jeannette Rankin FBI” or go to foia.fbi.gov/foiaindex/rankin_jeannette.htm. These reports were kept secret until recently. • What do these documents tell us about government concerns during the 1950s-1970s? • Why did they consider Rankin a threat? Do you agree? • Why are some parts of the report blacked out? 3. Vietnam War – Interview older people about the Vietnam War in the 1960s and 70s. • Did their opinions change over time? • Did they take part in war protests? • Did they know any draft resisters who refused to serve in the armed forces? • Compare your interviews with other students in the class. 4. Eleanor Roosevelt is mentioned on pp. 33 and 67 in the Rankin biography. • Find out more about her. How was she a “political pioneer” like Jeannette Rankin? • Write or act out an imaginary meeting between ER and JR, discussing peace, women in politics, and men in politics! See http://www.gwu.edu/~erpapers (The ER Papers Project) for a children’s bibliography. • Find out more about Gandhi. Many children’s biographies at all reading levels are available. • Write or act out a conversation between Rankin and Gandhi. See http://www.mkgandhi.org for students’ projects. • What was his ethnic background? How did that influence him as a politician? • What interests did he share with JR? How were they different? • Would he have made a good husband for JR? c. Give Jeannette her own color and trace her first journeys from Montana to Boston, New York City, Washington, DC, and San Francisco. d. Mark the different places Jeannette lived: Missoula, Montana; New York City; Washington, DC; Watkinsville, Georgia; and finally Carmel, California. a. Study a map of Montana. JR traveled six thousand miles in her state during the 1914 women’s suffrage campaign. Where do you think she might have traveled? b. Using the map’s scale of miles measure and cut a piece of string to represent 6000 miles. c. Attach pins to the map of likely places she visited, wrap the string around the pin, and keep stretching the string along the roads she might had traveled, until all the string is used up. a. Look for “U.S. women’s suffrage timeline” online or in an encyclopedia. Students will read through more suffrage history to find the dates and states. b. Color the states that gave women the right to vote before the 19th Constitutional Amendment was passed in 1920. Mark the dates women got the vote on the map. c. Make a chronological list of these women’s suffrage states. Where is Montana on the list? 1. Today women have the vote, but most of our elected politicians are men. a. Research your city council; your state legislature, and the U.S. Congress. b. What % of elected representatives are female? c. Why do you think so few politicians are female? 2. Write a report about a female lawmaker in your state. a. Find out about her early life. Did she have a hard time breaking into politics? b. Read her website. What issues is she most interested in? c. Write her a letter and tell her what you think about these issues. a. Do you think women can do as good a job as men as mayor of your town? b. As the governor of your state? c. Would you vote for a women president? d. Would you vote for a girl class president? e. Women make up about 50% of the population. Should we pass a law declaring that 50% of the members of Congress must be female? f. Add your own questions. g. Create a graph to show how people voted in your poll. 4. 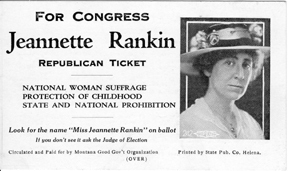 Jeannette Rankin worked for peace. She believed that we should keep an army to protect our own country, but we should not send our soldiers to fight in other countries. What do you think? 1. Choose an event from Jeannette Rankin’s life, such as the baby and the Indians (p 18,) the wounded horse (p 14,) the deaf boy (p 25,) the Sunshine Club (p 64,) etc. Write a short story with invented characters and dialogue. Be sure to add conflict to your story. 2. Form small groups and act out scenes from Jeannette’s life – real and invented: picnic at her father’s sawmill (pp 19-20,) speaking for suffrage on a street corner (pp 28-9,) speaking for peace in Vietnam (pp 84-87) or any other scene that might have happened. 3. Research the music sung by the protest movements in the 1960s. Look for recordings and learn the songs yourself. Search for “1960s protest songs”: Wikipedia; folkmusic.about.com: Ten Top Protest Songs; www.geocities.com/afvn3/historybac.html discusses songs with some lyrics; www.brownielocks.com/sixtieswarsongs: sing along with synthesizer and lyrics. 4. Throw a party – a women’s suffrage luncheon (pp 32-3, 37, 38) or a 1960s peace demonstration (pp 85-89.) Make posters and cartoons, dress in period costume, plan a menu, sing songs.